The GRACE Project for the Upper Peninsula (GRACE for UP) of Keweenaw County, Michigan is an amazing project-model for GIS-based education, with high school students using Esri GIS on two related real-world community projects in celebration of the 100th Anniversary of the National Parks Celebration. Not only is it a fertile ground for students firsthand, it provides professional development training for teachers so they can integrate GIS/T into STEM and social studies curriculums, thereby exposing 5,000 student explorers, and creating 2,500 student investigators and producing 300-500 qualified GIST interns. Randall Raymond, GIS specialist, NSF-ITEST GRACE Project, Advisor/Consultant and Dr. Don Lafreniere, director of Historical Environments, Spatial Analytics Labs, director Geospatial Research Core Facility, Great Lakes Research Center, Assistant Professor of Geography and GIS, Department of Social Services, spearheaded this project with the State of Michigan Teacher Development Association and were able to connect them with the National Historic Parks and the Michigan Tech Time Traveler project. The goal of the partnership was to bring GIS education and paid summer internships to Copper Country high school students. The upshot was a summer program of internships with students creating storymaps and using GIS tools, working with GIS on a daily basis on two community projects. The students become well-versed in ArcGIS and ArcGIS Online, and have an ArcGIS organization account. They work with maps, geodatabases and accumulate 41 hours of training. Raymond and Lafreniere coordinated with the technology coordinator at the high schools who identified students who had taken advanced computing courses that included primer GIS, or other qualified students who would be good candidates for the program. The students put their skills to work immediately when they are assigned to a community project. In order to develop the Citizen Historian Portal Design for the GRACE project, for example, organizers held a charrette with students to come up with a design that would be useful for the community in the making of Citizen Historian kiosks. Dr. LaFreniere’s project was the Keweenaw Time Traveler project, which is an online digital atlas for exploring, researching and sharing the social, environmental and economic histories and heritage of the Copper Country over time. 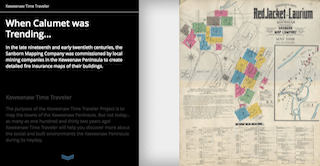 Data from citizen historians will be incorporated into existing data, and this atlas should be completed by summer, 2017. “The students became so enthusiastic that now their friends want to participate next time,” said LaFreniere. Archeological Material Culture Analysis with Dr. Carl Blair (Thursday Field Activities) Marine Mapping and Navigation, Historical GIS walking tour of Torch Lake, Complete Streets- Youth Activity Transportation Planning, assessing sidewalks for walkability, a look at how CLK schools have changed over time (looking at maps). This entry was posted on Tuesday, September 13th, 2016 at 4:46 pm. You can follow any responses to this entry through the RSS 2.0 feed. You can leave a response, or trackback from your own site.